In today's fast-paced work environment there are few tasks more frustrating or less productive - than wrestling with a stapler that jams constantly. The engineers at Rexel understand the importance of having the best equipment to help you work efficiently; after all, they have 70 years experience of desktop tool design behind them. 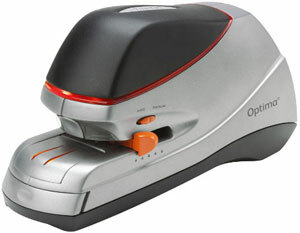 So if you need a fast, high-volume stapler that guarantees jam-free, automatic stapling of up to 40 sheets when used with Optima Premium staples and comes with a host of smart, value-adding features, the Rexel Optima 40 Electric Stapler is the ideal solution. Measuring 130mm (H) x 95mm (W) x 265mm (D), the Rexel Optima 40 Electric Stapler comes with a UK AC adaptor and is perfect for an individual desk or as a shared facility in a busy, small to medium sized office. Professional: time is money, and the Rexel Optima 40 Electric Stapler comes with some useful features to maximise efficiency. An LED low staple indicator flashes just before you run out of staples and a handy, built-in staple storage drawer means you have all your materials at hand. The flat clinch mechanism forces staples to rest flat against the paper which ensures documents stack neatly and can cut down on filing space by up to 30%. The adaptable throat depth allows for greater flexibility in staple positioning whilst the illuminated landing strip enables you to see details clearly for a perfect document finish. Fast: just insert your paperwork into the Rexel Optima 40 Electric Stapler and it will automatically staple your sheets together ready for the next batch. Strips of 105 staples are quickly and easily loaded at the front with a simple push of a button for minimal down-time. Accurate: the Rexel Optima 40 Electric Stapler comes with integral staple placement guides so you can be sure that every set of documents will be identical for a professional image. Intuitive comfort-grip user control ensures you're in charge of exactly where the staple goes and when it is released for 100% accuracy. Reliable: featuring a robust, metal mechanism, strong silver plastic casing and comfortable rubber grip on handle and base, the Rexel Optima 40 Electric Stapler is a stylish desk accessory that's built to last. It comes with a 5 year warranty, so you can purchase with confidence. Jam free: simply load up with Rexel Optima® No. 56 (26/6) Premium Staples, check the integral stack height gauge to ensure that you never exceed the maximum 40 sheets and make staple jams a thing of the past. A pack of 1,000 Optima staples is supplied so you have everything you need to get started.